The CasaFan ATVM poppet valve is suitable for transporting away exhaust air from all rooms that are furnished with non-flammable equipment. Its high-quality galvanised steel sheet is coated with a white epoxy powder. Thanks to an aerodynamic design the valve generates a minimum of noise with just about 35 decibels. 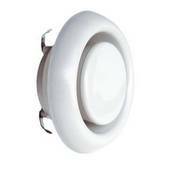 The appliance is inserted into the wall opening or directly into the ventilation duct, thin sheet metal pipes require the included mounting rings to ensure a secure fixation. The AVTM is a discreet addition to the ventilation system that does not appear too obtrusive. 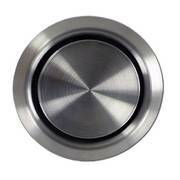 This CasaFan ventilation accessory is a durable product that promises years of reliable air exhaust. The ATVM is constructed with a wide edge that covers the opening and ensures stability. The surrounding area permanently remains clean as the integrated gasket prevents contamination and debris from infiltrating from the sides. 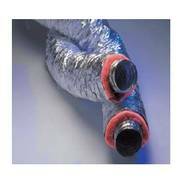 It evens out any imperfections and irregularities caused by pipes that have been plastered too deep and uneven walls. The pressure as well as the transported airflow are determined by the opening of the valve, by turning the disc both factors are adjusted. Use our quick selection chart to find out which ATVM model would be most suitable for your individual requirements. 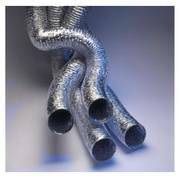 The data refers to the nominal width of the ducts or wall openings.